I already mentioned tonight’s Tiki Taix 2nd Anniversary, but Sunday’s going to be a good day to be a So Cal tikiphile, too. Otto von Stroheim is in town to turn the atrium of VacationFest into a Tikifest. VacationFest takes place at the Santa Monica Civic Auditorium from 10 a.m.-4 p.m., and is filled with travel vendors’ booths with information on tour packages, destinations, hotels, boat packages, you name it. Trips will be given away in drawings by several vendors. As at last year’s Vacationfest, the atrium of the building will be a tiki marketplace, with vendors of carvings, apparel and more. Otto will be selling copies of his Tiki Art Two book. 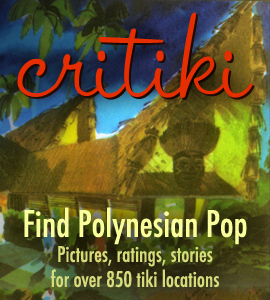 Doug Nason will have a presentation on Tikis of the South Pacific at 2 p.m. A coupon for free admission can be found at Otto’s website. Later that evening, Otto will be DJing at the new Puka Bar in Long Beach, from 9 – 11 p.m.